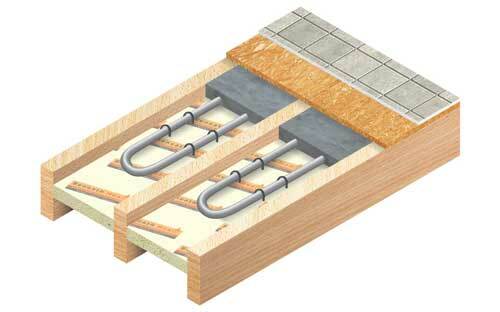 The Beneath Heat ‘Dry Screed System’ has been developed to be used in combination with timber joists to provide a secure method of securing the pipes. The Beneath Heat ‘Dry Screed System’ is used for joisted floors. All joists need to be fully exposed. Notch every other joist so pipework can pass between each joist void. Beneath Heat pipework is then laid in accordance with the Beneath Heat design provided. Pipe is secured using a pipe staple pushed into the insulation. Beneath Heat pipework is connected to the manifold, filled & tested in preparation for the dry screed mix to be spread & floor boards to be laid.